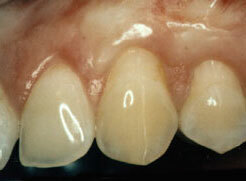 A gingival graft is designed to solve these problems. A thin piece of tissue is taken from the roof of the mouth or gently moved over from adjacent areas to provide a stable band of attached gingiva around the tooth. 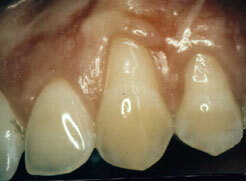 The gingival graft may be placed in such a way as to cover the exposed portion of the root. In a few weeks, the new tissue attaches to the existing tissue, which becomes almost undetectable to you and functions just as the gingival tissue that you had previously lost. The result is a healthier and more esthetically pleasing smile that lasts for the rest of your life. As an alternative to harvesting gum from the palate, we offer the option of using an allograft preventing the need for a second surgical site. An allograft is donor tissue comprised of human dermal matrix that allows your doctor to give you the tissue graft you need, without the limitations associated with harvesting the graft material from somewhere else in your mouth. As the body’s natural processes take over, your own cells move into dermal matrix. Over time, your cells transform this matrix into your own healthy gum tissue. Once recovery is complete, you won’t be able to tell the dermal matrix was ever there. The gingival graft procedure is highly predictable and results in a stable, healthy band of attached protective tissue around the tooth preventing further recession. The result is a healthier and more esthetically pleasing smile that lasts for the rest of your life.